I would have bet good money that The Hangover Part III couldn’t possibly be worse than Part II. Yet somehow this sequel manages to be even less funny, less plausible, and darker than its predecessor. Why couldn’t everyone just have stopped with the original? Must every movie become part of a multi-picture franchise? Are we not allowed to have a perfectly funny movie and just leave it at that anymore? Part III throws out the familiar structure of the first two in favor of a fairly predictable chase/heist plot. I personally didn’t mind that the first two were virtually carbon copies of one another, even though some potential improvements were overlooked (As Ben pointed out, it would have been interesting to have Justin Bartha’s character involved in the action.). But this movie is so far off formula that it doesn’t even feel like part of the same series. There’s no titular hangover that the guys are waking up from. There’s no backward story structure revealing the previous night’s events. There’s hardly any comedy to speak of. This film puts a huge emphasis on Zack Galifianakis’ and Ken Jeong’s characters. Both were fan favorites in the previous movies, but the real strength of those two films was the ensemble nature of the cast. There is much less of that in Part III. Galifianakis and Jeong are given more screen time than their cast mates, which is a big problem. They’re both very funny men, but their characters are selfish jerks who quickly become annoying. I don’t want to spend that much time with either of them. 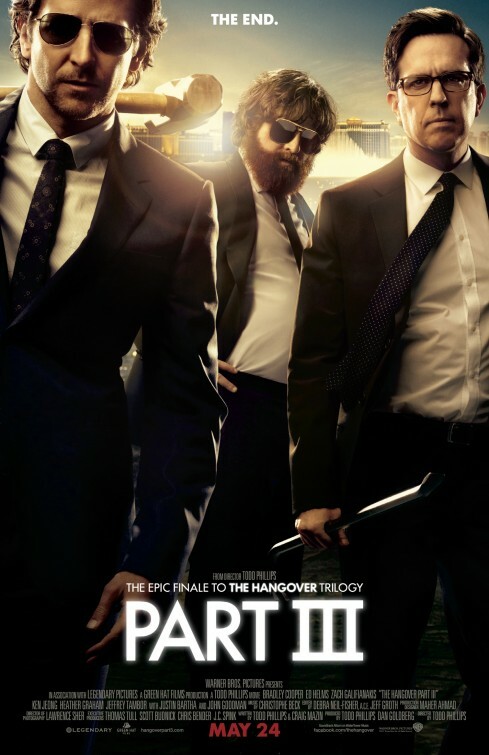 In a way, The Hangover series is much like drinking in real life: The first film is the intoxication phase, lots of fun and enthusiasm, with little thought of the consequences. Part II is the black out phase, fun stuff may have happened during this time but you probably should have quit drinking long before this point. Part III is the full blown hangover– you wake up sick to your stomach, head throbbing, and vow never to drink again. You know you probably won’t keep that vow, but let’s hope these filmmakers do. This is the perfect example of a film series that should have quit while it was ahead. The second Hangover made a motza at the box office, but I think all involved would be quick to realise it was not very well received by the fans. This film was always going to struggle due to the backlash after the second film, but its main problem is that it isn’t very funny. I’ve mentioned during my review for the second movie that I was so surprised it did not turn into the Zack Galifianakis show, as he was the breakout star of the first movie. While it was repetitive, the second film did a good job of keeping the ensemble cast going and giving everyone their chance to shine. The third movie does not do this. There is a definite emphasis on Galifianakis’s character as well as Ken Jeong’s Asian stereotype from the first two films. Both of these characters, particularly Ken Jeong, get tiresome quite quickly. I think I laughed no more than three or four times watching this movie. So we catch up with the ‘wolf pack’ a year or so after their last adventure in Thailand. Alan (Galifianakis) has stopped taking his medication and is more insane than ever. The guys decide to stage an intervention and take him to rehab. On the way there, they get caught up in one of Mr Chow’s (Jeong) capers involving stolen gold and Mexicans. Their luckless buddy Doug (Justin Bartha) is taken hostage while the guys have to steal back some gold that Chow has stolen from a Vegas gangster (John Goodman). Eventually the guys end up back in Vegas, trying to save their buddy Doug, while also trying to grab Chow for this gangster. I had big issues with this film, most of them relating around the fact that it wasn’t funny. The second film wasn’t great, but at least it made me laugh. This third film does not do that at all. There is also the problem that I no longer care about their predicament. In the first two films, you were along for the ride and wanted to see Phil (Bradley Cooper), Stu (Ed Helms) and Alan succeed, but now I just don’t care what they’re doing. This is probably due to the emphasis on Alan and Lesley Chow’s character. They are both quite unlikable, so you don’t really care what happens to them. The first movie was ground-breaking, and the second film was solid, if not a complete fabrication of the original, but this this third instalment of The Hangover series just lets you down.